‘Cause you know there’s no better place for a death machine to sit than on a fluffy cloud. Or a pair of cybernetic legs. Or a motion-tracking tripod. But mostly a fluffy cloud. The cake was done for my friend’s brother’s wedding. 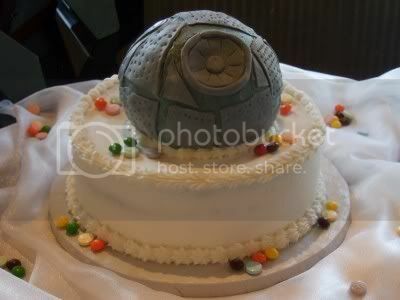 The Death Star idea came from him being such an avid Star Wars fan…It took about 3 hours baking time between the cookies, round ball cake and mixing up the mousse and frostings. Then about 1 1/2 hours to decorate…no time at all for the bottom round part, mostly that time was just ate up with covering the ball and gluing on the exterior pieces. Once placed out for service, it cut and served exactly like any other cake would—-because the chocolate chip cookies making up the “cake” part were soft and chewy. I keep seeing this cake explode, lol. This feels like a Death Star where Darth Vader would tickle you with the Force instead of choking you with it. That is just odd. I don’t understand making a cake out of cookies. Previous post: Geek Steal: Seasons of The Simpsons for $14.99 Each!